We are a respected Personal Injury Law Society Accredited solicitors firm and would be happy to help you if you have been involved in a bicycle accident. If the worst happens and you are involved in a cycle accident, you can bet your bottom bracket that Russell Worth will have your back covered and will do their all to see your bike accident claim through to success. Are you looking for a page on motorbike accidents? Complete the 15 second form below and we will call you back to discuss your claim. Alternatively, please call us for your free claim assessment on 0800 028 2060 or complete an Online Enquiry. We will talk to you in confidence and the initial assessment of your claim is FREE. We also operate on a No Win No Fee basis, so you pay nothing if you lose. Hats off to you if you’re a biker – there’s nothing more liberating than being on your bike – whether you’re on a leisurely bike ride to work or the shops (and of course full marks for being an eco warrior; more people should be like you). However, the hazards of cycling on the open road are quite evident – traffic is getting ever busier and people are rushing around in their cars like never before. Accidents are evidently on the rise as far as we can see as the number of claims we’ve seen is on the increase, too. Whilst cars are becoming ever safer for their occupants, there is little a bike manufacturer can do to protect a human on their steel horse. Add to this the fact that motorists have insurance to back them and it paints a slightly uneven picture for cyclist v’s driver. We believe that cyclists should have access to relevant legal representation to help address the imbalance in the event you are in an accident and wish to put in a bike accident claim. * Unless you are involved in a hit and run accident – your solicitor will advise you early on about this. Rehabilitation Our main priority is to get you the medical treatment you need. In addition to the medical treatment you may have received from the NHS, we will get you an expert medical examination and report done. And we may well be able to organise physiotherapy, psychotherapy and such assistance as part of your bike accident claim, to get you back in the saddle. 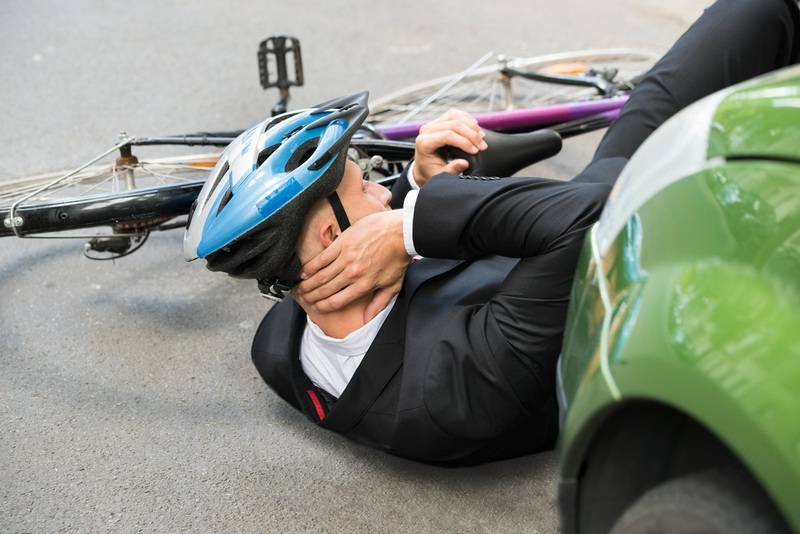 What should I do if I am involved in a cycling accident? Whether through wear and tear, poor road repairs , or a lack of maintenance – defective road surfaces are dangerous to cyclists. These can lead to the most serious cycling injuries and consequently the highest bike accident compensation amounts. Head and spinal injuries are common in serious accidents with motorists. To find out more about spinal injury compensation please click here. If you are involved in an accident caused by someone who is not insured , you may still be able to claim. In these cases, your claim proceeds through the Motor Insurers Bureau who deal with claims against uninsured drivers. It typically takes a little longer to process the bike accident claim but the end result is still the same. Charges may apply, speak to you bike accident solicitor. Pedestrians are all too often guilty of stepping out into the road without looking, which can lead to some nasty accidents. Bicycles are a lot less obvious than cars but they can still travel at quite a speed so it is important that pedestrians take heed of this when crossing the roads. If have an accident involving a driver who doesn’t stop, you may still be able to claim through the Motor Insurers Bureau who deal with these claims– there may be some fees to deduct from your compensation in these circumstances, but we will let you know that well in advance. 5) Stick to your side of the road – cyclists have a habit of skipping traffic by cycling on the wrong side of the road when they think it is clear. Not a good tactic as there’s nowhere for you to go if a car starts off towards you. 9) Avoid listening to music – If you cannot hear the other traffic, you lose a huge sense of the traffic around you, which causes accidents. 10) Indicate – hopefully if you are riding a bike, you have done your cycling proficiency so use it, it saves lives Russell Worth Solicitors – bike accident claims specialists. Fantastic. Everyone here is fantastic! Excellent communication and they were so helpful! Would 100% recommend!